Nowhere else in the world can you capture in a single photo frame three grand pagodas. Each was originally built over a thousand years ago. Pagodas are common in China, India and other countries where Buddhism flourishes. They are built to invoke divine protection against calamities and, sometimes, to store sacred scriptures and saintly remains. The architectural style markedly varies from country to country, region to region. Qianxun Pagoda (middle in photo) has 16 tiers and is 69 meters (230 feet) high. 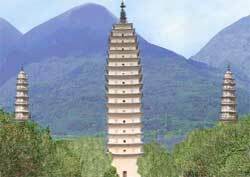 The two smaller pagodas have 10 tiers and are 42 meters (137 feet) tall. All three pagodas were built on the ruins of a Chongseng San Ta monastery. The site has a pleasing view of the mountains and lake. Hidden relics of the ancient Nanshao and Dali Kingdoms were discovered in the late 1970s during the renovation of the Three Pagodas. These proved invaluable to scholars. Most pagodas are usually best appreciated from a distance. Up close a pagoda appears disproportioned - and any physical deterioration can be easily seen. For a perspective view of the Three Pagodas and the region, take the cableway up the mountain to Zhonghe Temple. The Three Pagodas are a short drive northwest of Dali city, which lies 300 kilometers (180 miles) west of Kunming, the capital of Yunnan province.